A wide variety of objects were recovered from the cemetery including statuettes in stone, faience, and wood, amulets, beads, steles and hundreds of scarabs. Engelbach, Rex, Battiscombe Gunn, and Duncan Willey 1914. Harageh, 1913-14. Ancient Egypt 1914, 101-102. Engelbach, R. 1923. Harageh. British School of Archaeology in Egypt and Egyptian Research Account  (20th year). London: British School of Archaeology in Egypt; Bernard Quaritch. 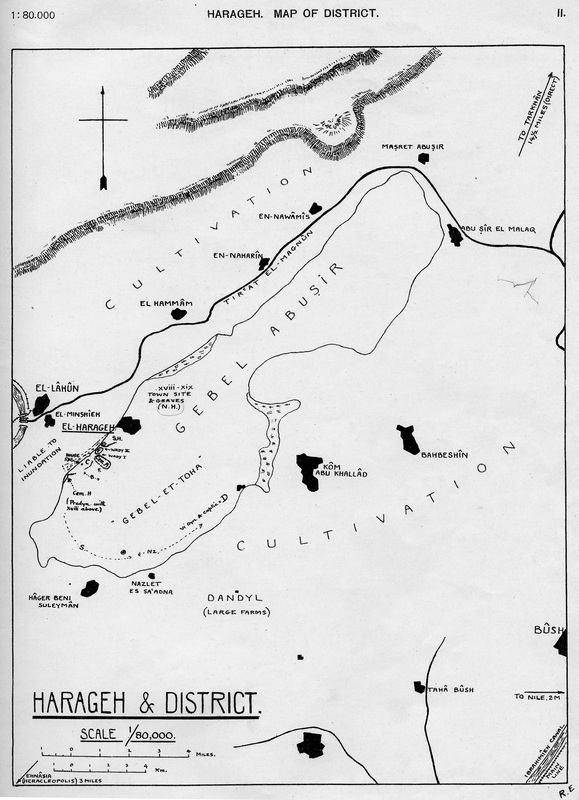 Sketch map of the area of Haraga, with the cemeteries shown. Engelbach 1914: plate II.